Oh, hello. 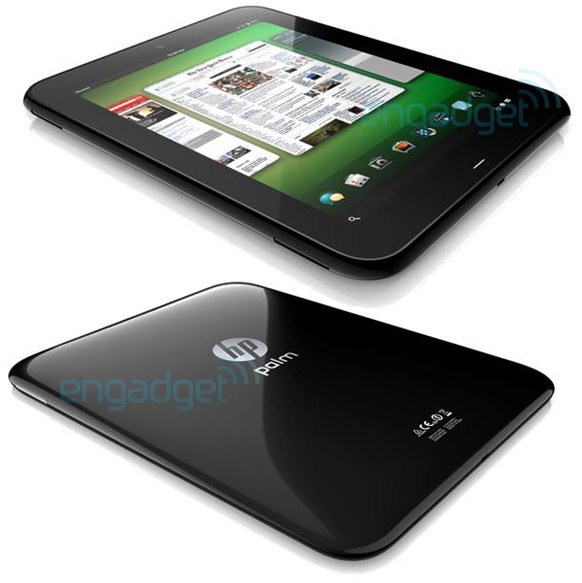 A trusted tipster just sent in these internal renders of HP / Palm's "Topaz" webOS tablet, which is one of two tablets currently being developed in Sunnyvale. That's right, two tablets: the 9-inch Topaz and a 7-inch model codnamed Opal -- a lineup that fits nicely into Palm's "Something big, Something small, Something beyond" tagline for its upcoming February 9th event. Looking at the render, we're seeing the no-button design we'd previously heard about (we're assuming the gesture area rotates with the display), a front-facing camera, a micro USB port on the bottom, and what appears to be a Vizio Tablet-style three speaker arrangement for stereo audio in both landscape and portrait modes -- that's two speakers along the left side and a third on the right. (That's just a guess, though.) We'd also note the back appears to be a glossy material, which might rule out a giant Touchstone for charging -- Touchstone backs have heretofore been soft-touch, but anything can change, we suppose.